A suspected grave robber in the central Russian city of Nizhny Novgorod is said by police to have made 29 life-size dolls from mummified female corpses. Local historian and cemetery explorer Anatoly Moskvin, 45, was arrested last week by police investigating a spate of grave desecrations in the area. 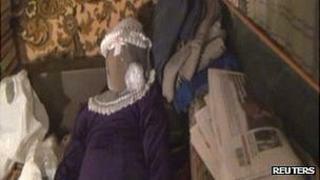 The brightly dressed dolls, their faces and limbs covered in cloth, were found in his flat and garage, police said. It was not clear whether each doll contained a set of human remains. Police are now trying to establish the identity of the mummified remains. They said they had been investigating "numerous" grave desecrations in cemeteries in and around Nizhny Novgorod since last year. Video released by police on their website shows the dolls seated on shelves or sofas, in small rooms stacked with books and papers. No actual bones are apparent in the footage and some of the faces are covered by masks. Officials said the remains belonged mainly to girls or young women, and they had been dressed in clothes taken from corpses. Also found in Mr Moskvin's flat were photographs and nameplates taken from headstones as well as instructions for making dolls and maps of cemeteries in the region, a police statement said. Shoes found in the flat matched footprints found in cemeteries, it added. Some Russian media are reporting that Muslim graves were singled out in the robberies. According to the police statement, Mr Moskvin is "well-known in academic circles" having studied Celtic culture at a leading Russian university, and is the author of many books and academic works. He is described in Russian media reports as a "necropolist", or cemetery expert. Police did not say how he had been arrested and Russian newspapers report variously that he was caught with a bag of bones or that detectives grew suspicious when they consulted him, as a cemetery expert, about the desecrations. Alexei Yesin, editor of a local newspaper to which Mr Moskvin contributed, told the Associated Press news agency he was a loner who had "certain quirks" but said he had given no indication that he was up to anything so strange. "I saw no signs of that while working with him," Mr Yesin said. In a 2007 interview with the newspaper Nizhegorodsky Rabochy, Mr Moskvin said he had begun wandering through cemeteries when still a schoolboy. He claimed to have inspected 752 cemeteries across the region from 2005 to 2007, often walking up to 30km (20 miles) a day. He said he had drunk from puddles, spent nights in haystacks or at abandoned farms and had once even slept in a coffin readied for a funeral.